Summer fireworks festivals 花火 are the best way to see loads of people in their super cool yukata and, of course, an excuse to drink outside. There can be anywhere between 1000 to 20,000 fireworks, over a period of up to 90 minutes of explosions! It really is quite impressive if you don't mind the extreme crowdedness of up to a million people and annoying omnipresent announcements that are supposed to keep people in check... you know, the typical "friendly" reminders to "take a photo with your heart, not your camera" and "please continue this way" as if you need instructions for that! 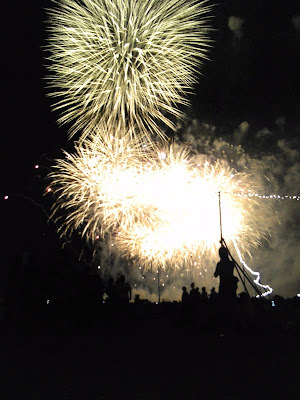 There are countless fireworks festivals in Tokyo, especially in the summer, but they're almost all impossibly crowded. Keep in mind that there are often buildings in the way so if you don't get a good spot hours beforehand, you might hear more than you see. The best one with unobstructed view is the Tamagawa Fireworks Festival たまがわ花火大会, a fireworks "battle" between the Tokyo and Kawasaki side of the river... the fireworks seem like they're literally inches in front of your face. Up-close. Real close. I've never experienced anything like it. Of course, after it's over, you will get stuck there, unable to get on the train, for at least 2 hours, until you finally get to inch towards the station at a snail's pace. Even with my extreme hatred of this type of heavy human congestion, especially in the crazy humid summer heat, I think it's worth seeing at least once! If you dislike crowds as much as I do, check out Atami Fireworks, a little far but more frequent and less crowded. For a combo of traditional festival and fireworks, try Chichibu Night Festival in December.